Trained at the Drama School Jacques Lecoq in Paris, Abbi Patrix has been exploring the art of storytelling for the past thirty years with his Compagnie du Cercle, founded by him in 1980. Working either as a solo performer or with other artists, he has a taste for mixing the spoken word with other disciplines such as dance, music and mime. 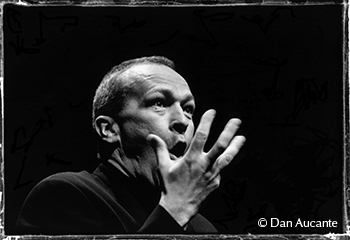 His work is at the cross-roads of theatre, music and movement, enriched by multidisciplinary material, on a permanent quest for new ways and voices to enrich the form of storytelling: an art which is developing today with great impetus in many different places in France and abroad. In his productions Abbi Patrix uses both personal and contemporary forms, which he constructs using different sources: traditional stories, life-stories, diaries, his own memories and literary texts. Half-Norwegian and half-French, Abbi Patrix always had a taste for the international and artistic exchanges. He has toured widely in France, Great Britain, Scandinavia and West Africa and performs in both French and English. Two of his shows, To the Ends of the World and The Companion were performed at the Barbican Centre, the Soho Theatre and the Shakespeare Globe Theatre in London, at the Times Cheltenham Literature Festival, as well as in different storytelling festivals: the Scottish Storytelling Festival in Edinburgh, Beyond the Border in Wales, Brighton Storytellers, the International Storytelling Festival of Jonesborough in Tennessee USA, and festivals in Denmark, Sweden and Norway. He also takes part in conferences and gives master classes worldwide. Co-director of La Maison du Conte (an Arts Centre in the suburbs of Paris dedicated to the art of storytelling in all its forms) from 2001 until 2010, Abbi Patrix was also Educational Director. He has been running « Le Labo » (the laboratory) for the past seven years: a collective and multi-disciplinary space for research, improvisation and transmission. He is currently continuing this work at Anis Gras, le Lieu de l'Autre, in Arcueil. 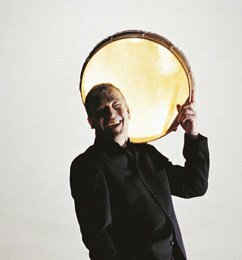 His powerful rhythmic work has earned Abbi Patrix an international reputation as one of the greatest of Europe’s performance storytellers. Some of his work is published by Editions Paradox in the series Conteur en Scène. Abbi Patrix in the serie of videos by Pascal Quéré "Être conteur aujourd'hui".